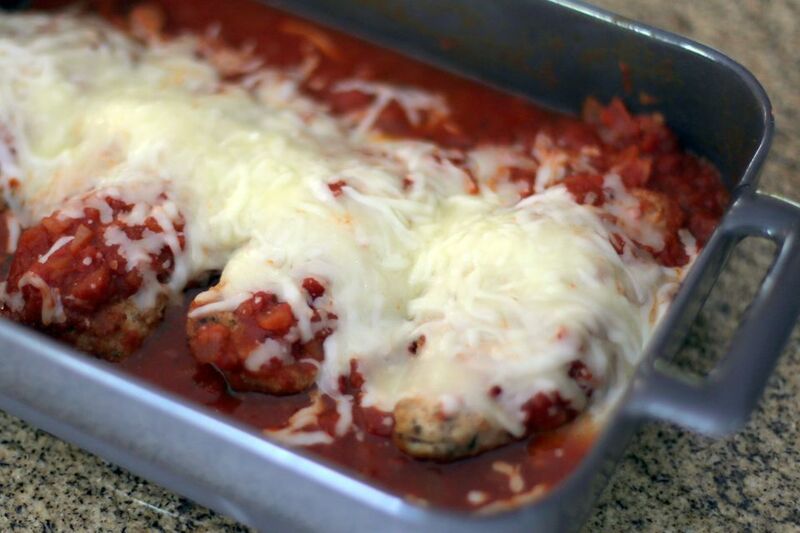 This baked chicken Parmesan starts with Parmesan-coated chicken breasts. The breaded, oven-fried chicken is then baked with prepared spaghetti sauce and shredded mozzarella cheese. Of course, you can use your own homemade spaghetti sauce or marinara. This is an easy dinner to prepare, and you can keep it relatively low in fat with low-fat mozzarella or the lower amounts of cheese. If you're short on time, use seasoned fine dry bread crumbs and a little Parmesan for the coating. One standard serving of chicken is about 4 ounces, so two or three large chicken breast halves (8-ounce or larger) would be enough for four people. The quality of the cheese makes a difference. Freshly shredded Parmesan will have much more flavor than pre-shredded Parmesan. It's worth buying a wedge of good Parmesan and grating it immediately before use. For a full and satisfying dinner, serve the chicken and spaghetti with a tossed salad and garlic bread. Line a baking sheet with foil; spray with olive oil spray or nonstick cooking spray. In a food processor, grind the breadcrumbs, Parmesan, basil, parsley, a dash of pepper, and 1/4 teaspoon salt until fine. Pour this mixture onto a plate or shallow bowl. Pound the chicken breasts halves lightly to flatten them to a uniform thickness. You can avoid some kitchen mess and contaminating your surfaces if you place the breasts between sheets of plastic wrap before gently pounding them with a mallet or rolling pin. If you are using thin cutlets, there should be no need to pound them. Whisk the egg with the milk in a shallow bowl. Dip chicken pieces in egg mixture then coat them with the breadcrumb mixture. Arrange the chicken pieces on the baking sheet. Bake the chicken for 15 minutes, then turn the chicken over and bake for 10 minutes longer. To ensure the chicken is done, check with an instant-read thermometer. According to the USDA, the minimum safe temperature for chicken is 165 F. Remove the chicken from the oven and reduce the oven temperature to 350 F (180 C/Gas 4). In an 11-by-7-inch baking dish, spread about one-third of the spaghetti sauce. Arrange the cooked chicken in the sauce; pour remaining sauce over chicken. Sprinkle with Mozzarella cheese. Place the pan into the oven and bake for 15 to 20 minutes longer, or until the sauce is bubbly and cheese is melted. Meanwhile, cook the spaghetti in boiling salted water following the package directions. Drain the pasta thoroughly. Serve the chicken and sauce with the hot drained spaghetti. If you prefer to fry the chicken on the stovetop first, make a recipe for simple fried chicken breast cutlets, then bake them with the spaghetti sauce and cheese.